Lockheed Martin stock is down 0.9% today (Wednesday) at $201.71 as the global aerospace titan rolled out its first highly anticipated F-35A Lightning II for the Norwegian Armed Forces. Despite today's muted reaction, Lockheed Martin Corp. (NYSE: LMT) stock will benefit as more F-35s are delivered across the world. The F-35A Lighting II is an innovative fifth-generation fighter jet. 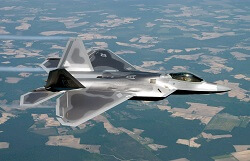 Lockheed Martin describes it as "combining advanced stealth with fighter speed and agility." It also includes fully fused sensor information, network-enabled operations, and advanced sustainment. The three variants of the F-35 will replace legacy fighters for the U.S. Air Force, U.S. Navy, and U.S. Marines. It will also be used in at least 10 other countries. In short, the F-35 is the largest military contract in history, with Lockheed as the principal contractor. It is part of the $1.4 trillion, 56-year F-35 Joint Strike Fighter project. Others involved include Northrup Grumman Corp. (NYSE: NOC) and BAE Systems Plc. (OTCMKTS ADR: BAESY). The fifth-generation F-35 fighter has been in development for 14 years. The Marine Corps fielded the first combat-ready squadron of F-35s this summer. The U.S. Air Force plans to introduce the plane next year. The Navy has a target date of 2019, at which time the aircraft is expected to enter full-rate production. With the F-35s, the U.S. military is confident it is introducing a cutting-edge weapon system capable of outclassing even modern, super-maneuverable Russian and Chinese aircraft like the Sukhoi T-50. FYI. The picture you have above is an F-22 not F-35A.